With the 1970s behind him, San Diego's top-rated newsman, Ron Burgundy, returns to take New York City's first twenty-four-hour news channel by storm. Stars: Ben Stiller, Jack Black, Robert Downey Jr.
(Announcer): And here in Malaysia, there is an almost overwhelming sense of euphoria as the newly-elected prime minister has given this nation a gift of hope promising to raise the substandard minimum wage and end child labor once and for all. Already considered a living saint he has become this small country's greatest hope for a thriving future in the new millennium. 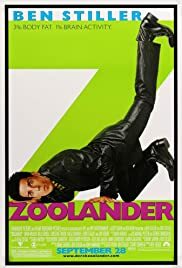 contains samples from "Wild Child"
Released a few short weeks after Sept. 11, Zoolander became the target of "this is why they hate us" diatribes. I didn't see it until months later and immediately recognized what I can only hope I would have seen if I had watched it earlier--that this is a superb satire/farce. There aren't many movies that manage to be both silly and smart at the same time, and this is one. It is not only a send-up of the modeling and fashion industries, admittedly easy targets, but of our whole image-obsessed culture which commodifies love, spirituality, patriotism, heroism just as easily and unthinkingly as it does kitchen appliances. This is not a "stupid" movie, even though it is about stupid people and stupid situations. It keeps the targets of its satire within its sights at every moment, never letting that focus flag to pursue maudlin subplots, but at the same time, it is unfailingly hilarious, with marvelous comic acting, sight-gags, sets, and costumes. The screen is just packed with visual jokes at almost every moment. This is not a movie that anyone needs to be embarrassed to watch or enjoy. But it is also just plain damned fun! 91 of 109 people found this review helpful. Was this review helpful to you?